Fit very well with any casual decor. Quality item. From Daniel Hocker of Park Hills, Kentucky on 2/13/2017 . 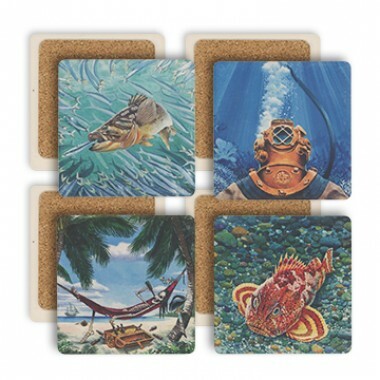 This four-piece coaster set is worth every penny. The images are beautiful and the bottom is non-slip. They don't stick to the bottom of a "sweaty" glass either. Now you can rest your Sculpin on the image of a Sculpin. They also make for great conversation pieces. Get a set while supplies last!